Scientists can take a lot for granted when they study stress, the force per unit area on an object. They handle stress mathematically by assuming it to have symmetry. That means the components of stress are identical if one transforms the stressed object with something such as a turn or a flip. 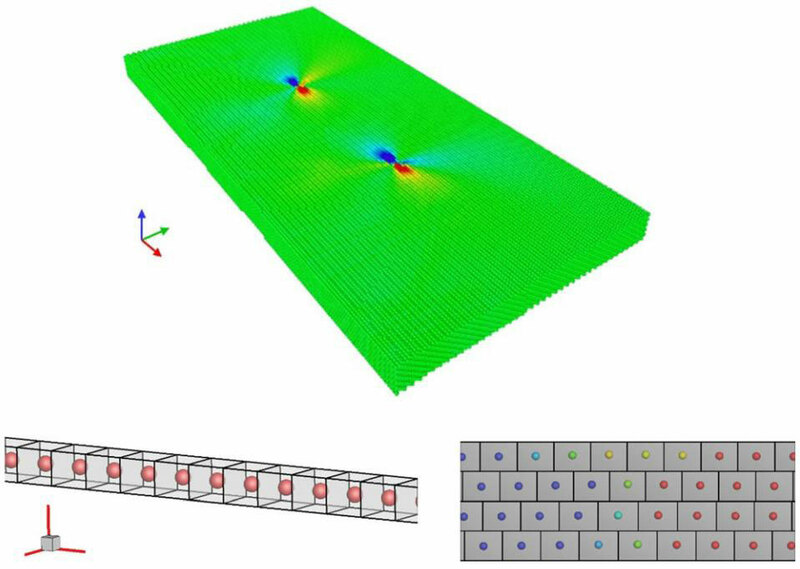 Now, supercomputer simulations show that at the atomic level, material stress doesn't behave symmetrically. The findings, published in September 2018 in the Proceedings of the Royal Society A, could help scientists design new materials such as glass or metal that doesn't ice up. Xiong and his colleagues treated stress in a different way than classical continuum mechanics, which assumes that a material is infinitely divisible such that the moment of momentum vanishes for the material point as its volume approaches zero. Instead, they used the definition by mathematician A.L. Cauchy of stress as the force per unit area acting on three rectangular planes. With that, they conducted molecular dynamics simulations to measure the atomic-scale stress tensor of materials with inhomogeneities caused by dislocations, phase boundaries, and holes. What's more, added Xiong, is the lack of a well-established computer code that can be used for the local stress calculation at the atomic scale. His team used the open-source LAMMPS Molecular Dynamics Simulator, incorporating the Lennard–Jones interatomic potential and modified through the parameters they worked out in the paper. Xiong was awarded supercomputer allocations via the National Science Foundation-funded eXtreme Science and Engineering Discovery Environment (XSEDE), on the Comet supercomputer system at the San Diego Supercomputer Center at UC San Diego; and Jetstream, a cloud environment supported by Indiana University, the University of Arizona, and the Texas Advanced Computing Center. What impressed the research group most about Jetstream was the cloud monitoring. “During the debugging stage of the code, we really needed to monitor how the code is performing during the calculation. If the code is not fully developed, if it's not benchmarked yet, we don't know which part is having a problem. The cloud monitoring can tell us how the code is performing while it runs. This is very unique,” said Xiong.